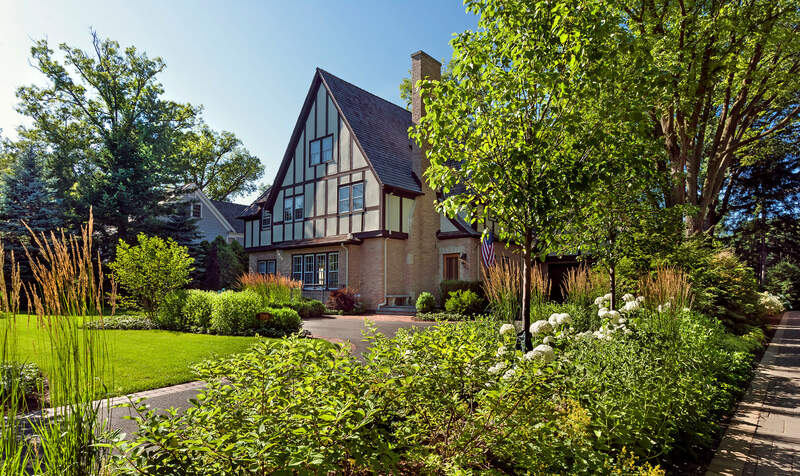 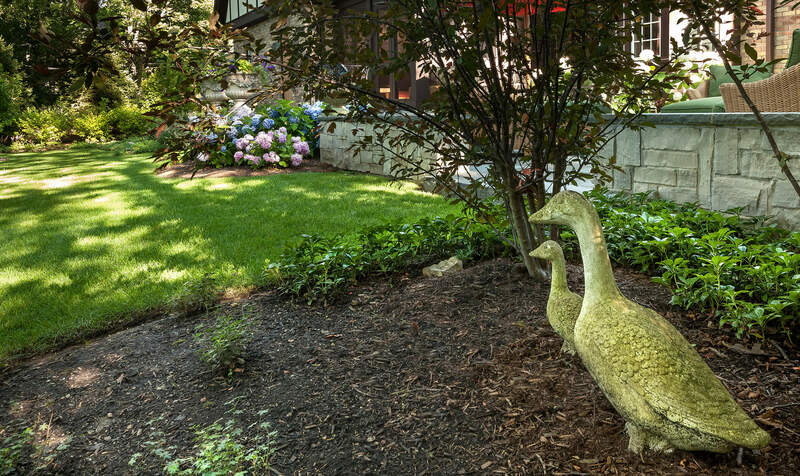 The landscape renovation restored elegance and functionality to this English Tudor-style home. 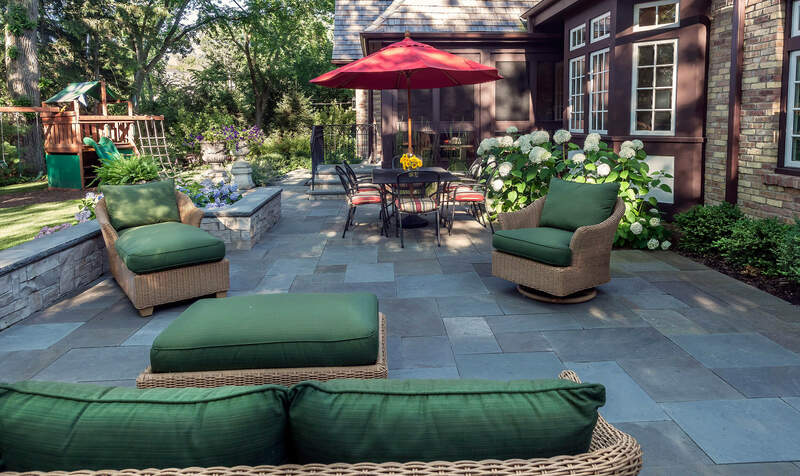 Collaboration with the architect and builder resulted in a dramatically different use of space, reclaiming over 1,600 square feet of prime outdoor living area previously occupied by a protracted asphalt driveway and wood deck. 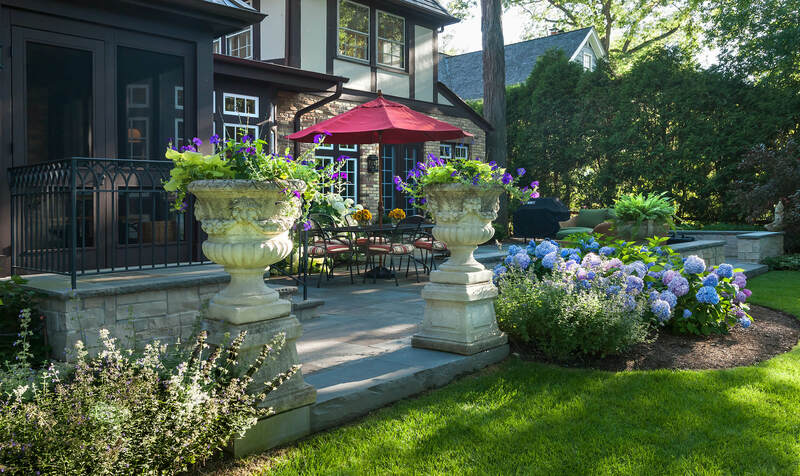 The redesign of the rear yard had to be considered and executed to some degree prior to the construction of the new two-story garage and screened porch to take advantage of access for concrete delivery to pour the building foundations as well as the stair, stoop, window well, and wall foundations. 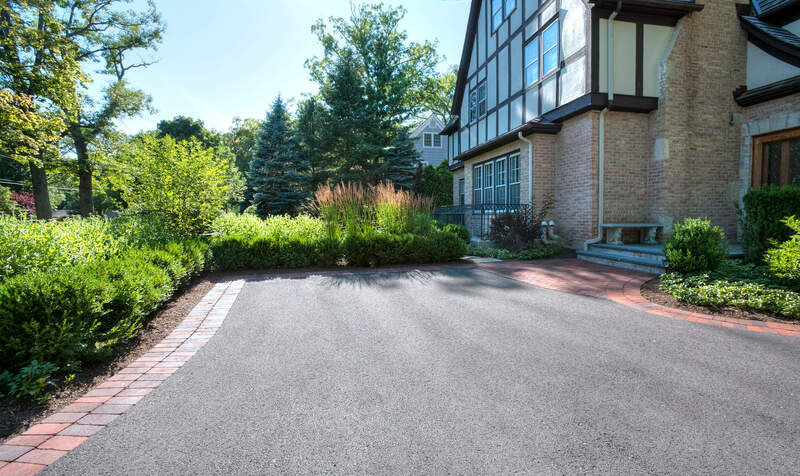 Demolition of the asphalt driveway around the back of the house became more arduous as layer after layer of old construction spoils were unearthed. 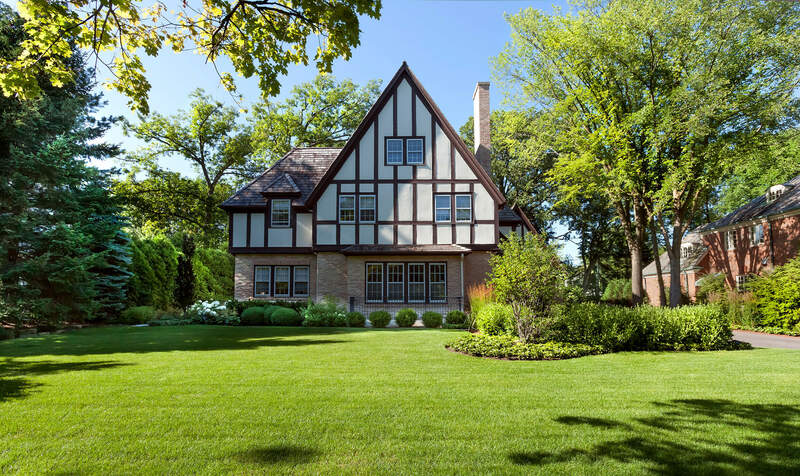 New outdoor spaces and structures were designed to harmonize with the traditional character of an English Tudor home utilizing classic stone and brick materials finished in a traditional manner. 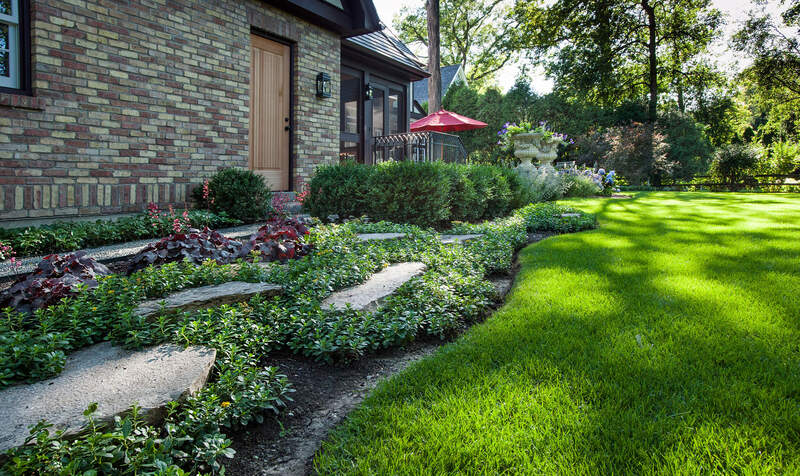 The combination of bluestone walking surfaces, clay brick paver accents, and Eden stone masonry provide a textural balance with the materials used on the home’s exterior and a measured infusion of color. 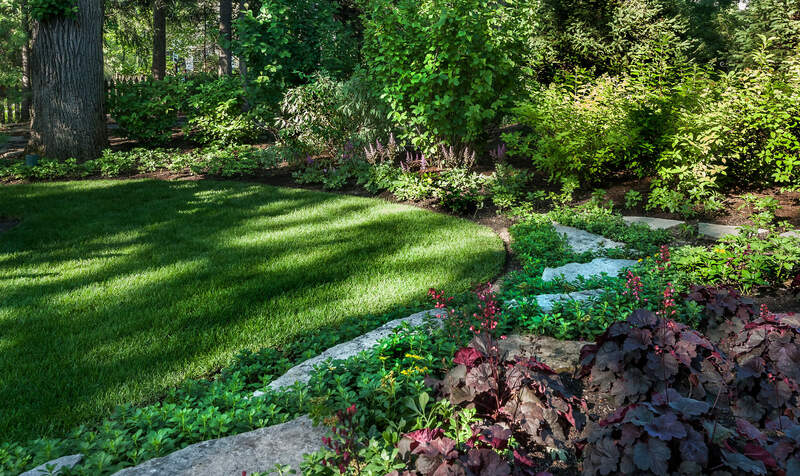 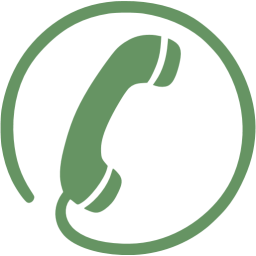 Conversely, new technologies such as a self-draining irrigation system were utilized to provide the homeowners with the convenience and performance they desired. 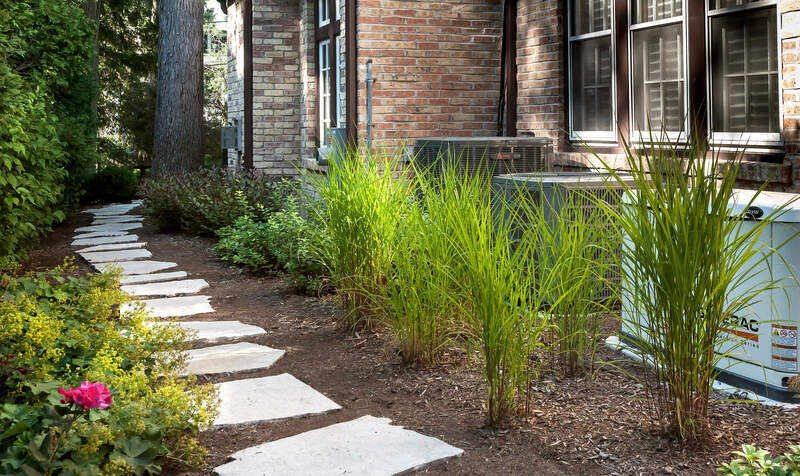 Contemporary strategies in managing stormwater runoff were incorporated to avoid directing water onto neighboring properties or municipal sewers. 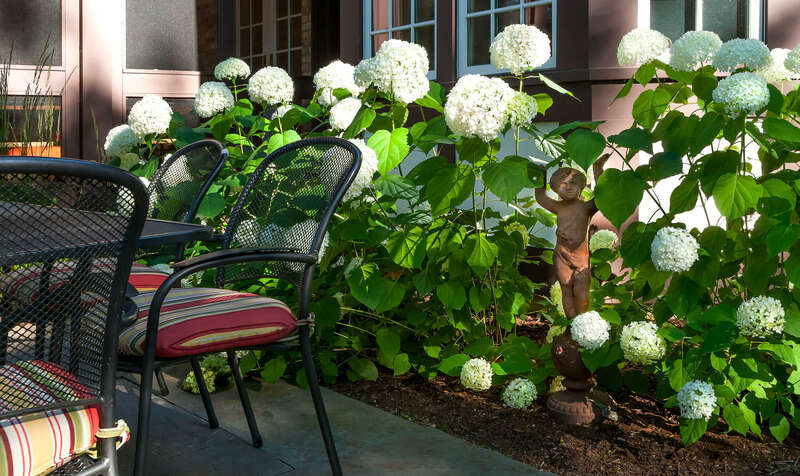 Planting beds in the front and rear integrate characteristic English garden plants like Boxwood, Hydrangea, Coral Bells and Astilbe along with today’s hardy ornamental grasses and smaller-scale ornamental trees hand-picked by the client. 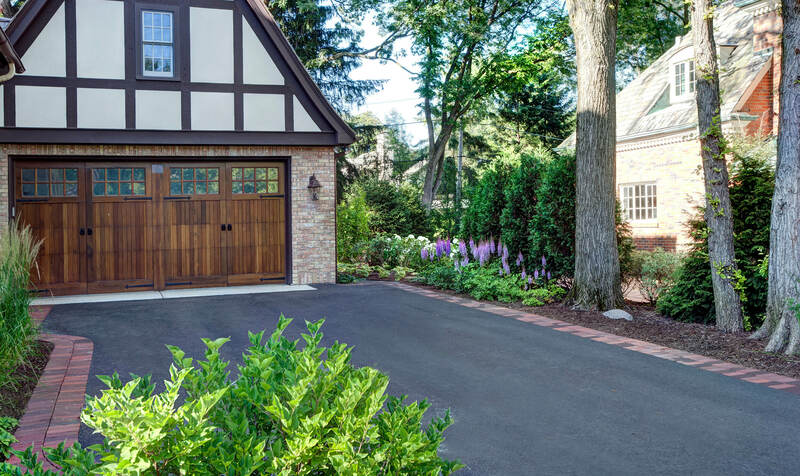 With a generously-sized front lawn, a vehicular turn-around was positioned near the front door to provide guests with a convenient space to disembark, and enable the homeowner to pull out of the driveway facing forward. 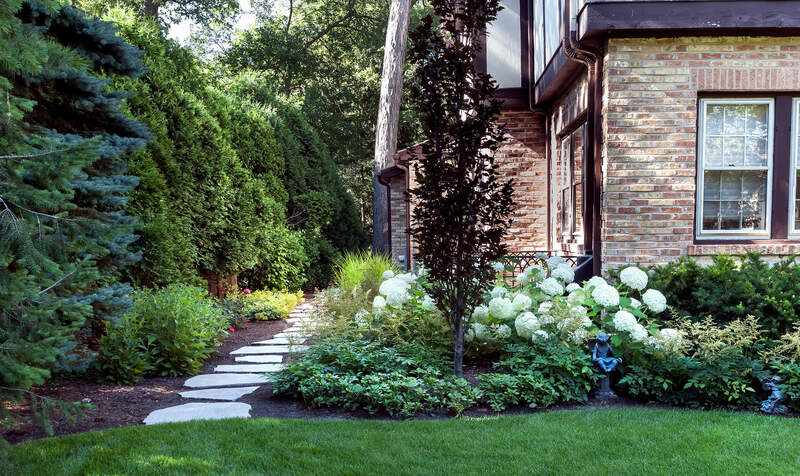 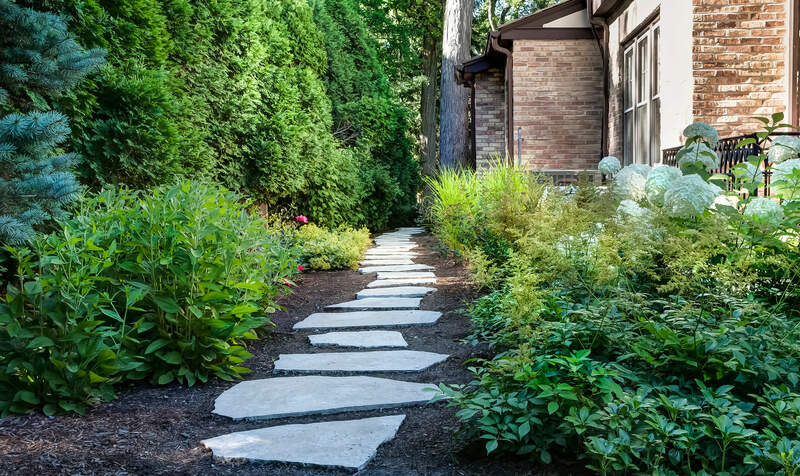 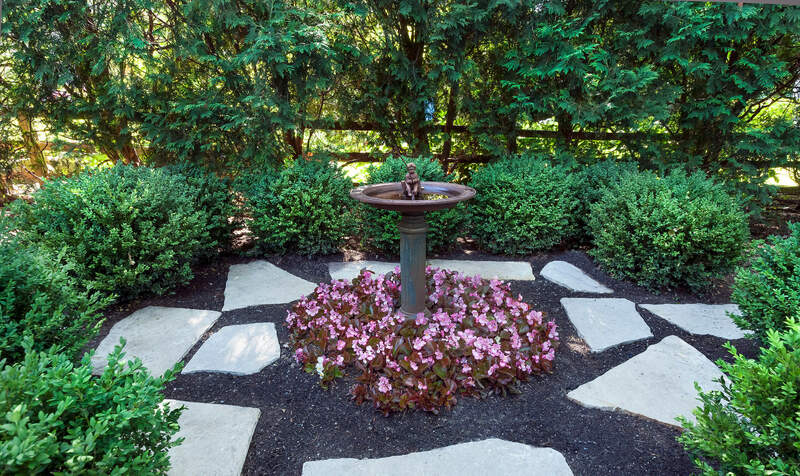 Alongside the driveway, a lush composition of ornamental trees, flowering shrubs, ornamental grasses, and groundcovers improves the undervalued space in between the two driveways and allows rainwater to be reabsorbed on site. 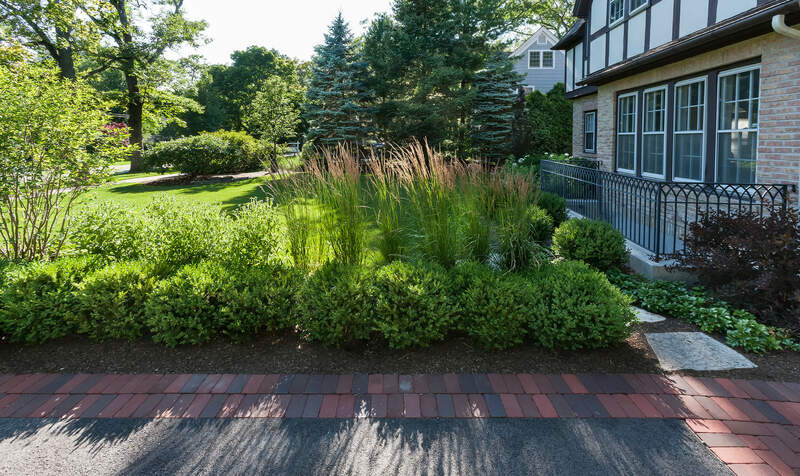 As a shared space with the adjacent property, the planting palette incorporated the preferences of both neighbors while achieving a cohesive design.